Had I thought a little more about this one, I would have taken a before picture of this dress. I have tried to refashion a few vintage garments over the years. Sometimes, I tried to do too much to a garment and it failed. This dress almost didn't make the operation I did on it. Most of the issue with this dress is the cut, it's on the bias. Bias cut can be tricky to fiddle with, at least that's my humble opinion. Okay, this is what I did to her. She had a very full sweep. She also was a long dress. Almost to my ankles. I felt my figure was a bit lost in all the fabric. So, I ripped out the seams of the skirt and cut a straighter version, which is hard to do with an existing bias cut skirt. Anyway, got the side seams fitted but I also needed to put in the hem, my dress form wasn't helpful with this. I found that wearing the dress was the best way to get an accurate hem pinned in. Well, she made it through the operation, I am glad to say. What do you think? Is it harder to sew a pattern or refashion a garment? I am happy with the result and plan on popping this dress on with some cute sandals for summer. I like the fit of this dress at the waistline. WooHoo, somebody's hopeful for spring, 6 more weeks of white! Here's the fabric up close. Finally, this dress, in a nutshell, reminds me of what I want to be and who I already am. It's seen a thousand summers days and still it's fresh, clean and happy to look at. It reminds me, I am a woman, and like it or not, I am delicate even though I am strong. It's also a dream, a dream of being something more than I currently am. A woman with a beauty to offer all around her. Some days I fail, other days God's strengthen me and much is accomplished. At the end of the day, at the end of my life, I want to wear dresses and be that old lady who hugs people, bakes pies, speaks kind words and lives life to the full, as she extends her hands out to do much for others. Can a dress do all this? I don't think so, I just know that whenever I wear a vintage dress I feel really good in my skin and it seems to pour out to others. Your thoughts are beautiful and reflect the way I wish to live as well. This dress is so refreshing and pretty. I would love to wear it. You did an amazing job on the refashion. I have actually found it more difficult to do some refashions and thought it would have been easier to start from scratch with a pattern. The dress and the cut is just wonderful on you. Anonymous, yes that's the dress but I had already doctored her up and the dress was sitting for a month for me to hem her. I am sometimes slow to finish things. Trudy, thanks I am going to keep at the refashioning thing because of my love of thrift shopping but I agree with both you and Maria it's easier to use a new pattern and cut it to your size! Oh that's so pretty - the colour and the shape really suit you (I know the similar Swing Dress is going to too! )- I have heard that hemming a bias skirt is tricky as it stretches out unevenly under its own weight. This fabric looks very light though, so maybe it wasn't such an issue. I think the dress is beautiful, and I love the thoughts that go with it. Beautiful thoughts in a beautiful dress! Thank you Mrs. Exeter and Annebelle! You do WONDERFUL work! I don't have an inch of sewing talent in me, ugh! But, I love the color, and the dress looks fabulous on you. Oh, thank you Lady Rose, I am very much a beginner. I didn't wear the dress for very long outside, was a bit cold, just having fun! So you want to sew? It's worth it, if you ever felt frustrated with the lack of clothing in RTW. Mostly, I struggle with not finding good fit or garments with pretty colors. I hope you learn, so fun. Thanks for your sweet thoughts! (I received one today and I would like to pass it onto you as well). If you would like this honour, could you please stop by my blog site and copy and paste the badge to your site. Thank you. Hi Marie, I am honored, thanks so much, I will be working on the email thing, I haven't set one up yet. 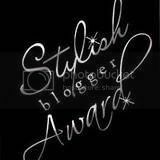 I will copy and paste the stylish blog award and pass it to others. Thanks again. Can I make a link back to your blog for the readers here? Wow, this dress really suits you, I especially like the details around the waist. Great idea, I like how you think! 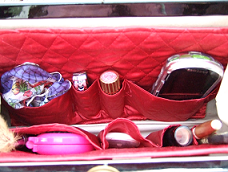 Kitten loves vintage, I have really enjoyed your blog and love, really love your style! So refreshing to know that there are other women who are sewing and enjoying their vintage dresses! It adds a little more joy to a joyful life of God's good gifts.